Our full head hair extensions in dark brown are available in both standard and deluxe sets, to ensure that you can get the perfect match for your hair type. 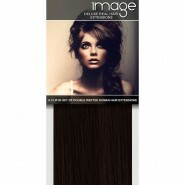 These gorgeous dark brown clip in extensions are a rich, warm shade and can be cut and styled to blend perfectly with your own hair. Every set that we stock are all made from the same high quality human hair and are available in a variety of lengths ranging from 16" through to the incredible 26", so if you're looking for the best hair extensions then why not clip in IMAGE today.